Archealogy, with a local twist, was the topic of discussion this Thursday at Eager Free Public Library in Evansville. 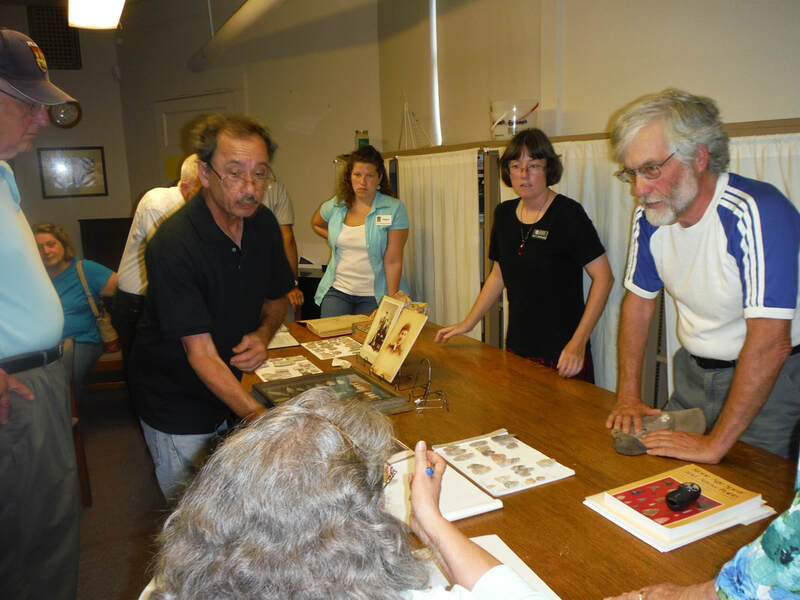 On July 23, 2015, Eager Free Public Library and The Grove Society of Evansville will sponsored a program about Southern Wisconsin archaeology presented by Amy Rosebrough, Staff Archaeologist at the State Archealogy and Maritime Preservation Department of the Wisconsin Historical Society. Dr. Rosebrough’s presentation, “Archaeology of Southern Wisconsin,” was an overview of Wisconsin archaeology during the 13,000-year span of Wisconsin’s history. The presentation coincided with the Grove Society's newest acquisition of arrow points donated by Nancy Norgord of Oshkosh. 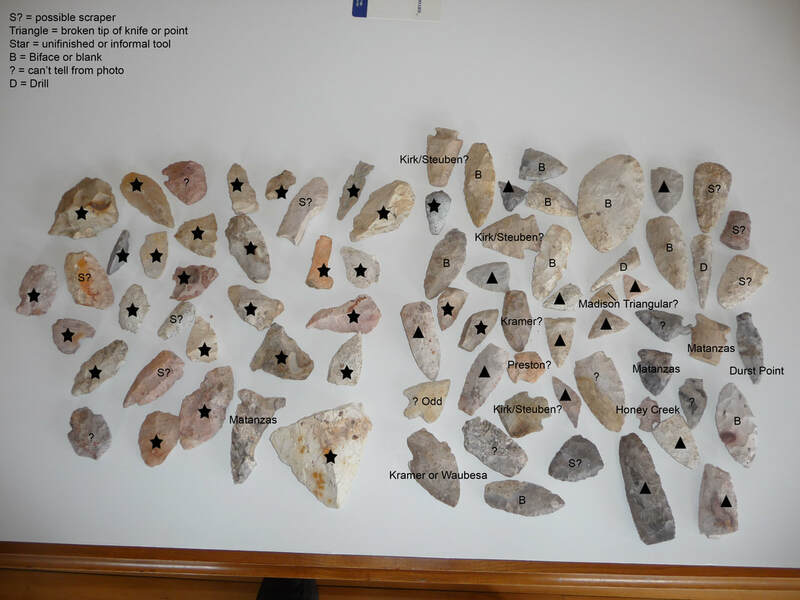 The arrow points, some possibly 8,000-10,000 years old, were found on a farm owned by her maternal grandparents, Marvin Patterson and Leticia (Finn) Patterson. The farm was located on what is now Evansville’s east side. Nancy’s mother was Genevieve Patterson, daughter of Marvin Ernest and Letitia Finn Patterson. The farm was located east of Evansville, on Main Street/Highway 14, between Dean Clinic and County Highway M.
The Patterson family moved to the farm on March 1, 1914 as Marvin “wanted more outdoor work,” Nancy Norgord said. He had been employed as a train dispatcher in Baraboo before moving to Evansville. The points were found on the farm over a period of years while Marvin and his family lived there until they moved to South First Street. Rosebrough has a PhD in anthropology/archaeology from the University of Wisconsin -Madison with a focus on effigy builders, their mounds, and their pottery. The presentation will take place in the program room, in the lower level of the Library. Eager Free Public Library is located at 39 W. Main St., Evansville. The building is handicapped accessible. The phone is 882-2260. The website address is: www.als.lib.wi.us/EFPL. You can follow the library on Twitter (EagerFreePL), Facebook (Eager Free Public Library) and Pinterest (eagerfree). The library hours are: Monday through Thursday, 9:30 a.m. to 7 p.m.; Friday, 9:30 a.m. to 6 p.m.; Saturday, 9:30 a.m. to 1 p.m. 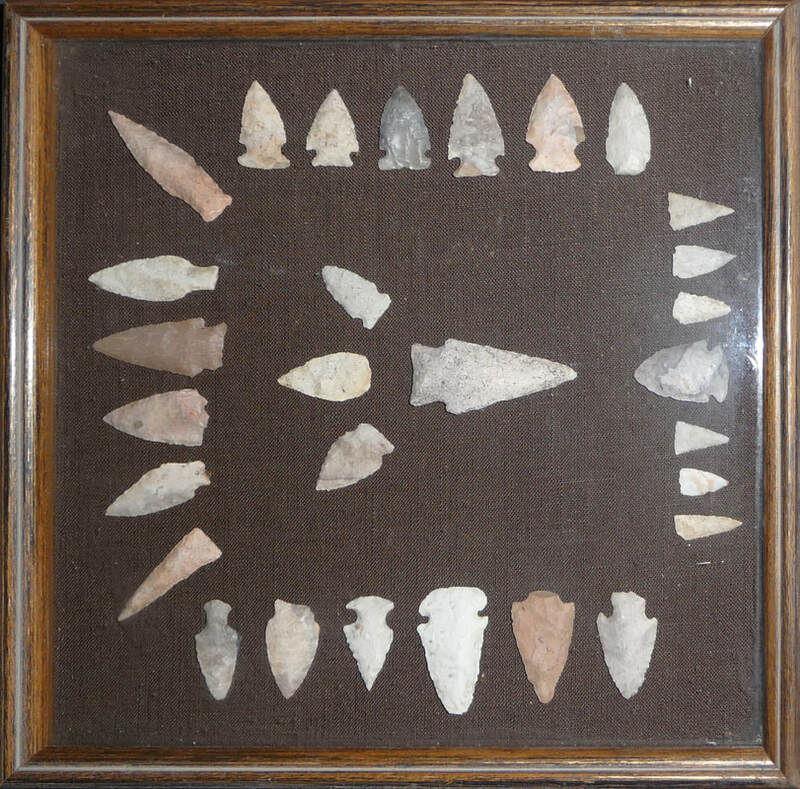 Photograph of framed collection of arrow points donated to the Grove Society by Nancy Norgord of Oshkosh. Photograph of cigar box, which stored the arrow points before Genevieve had some of them framed. The handwritten note was found inside the box.